The pattern recommends 1,200 yards of laceweight tussah silk yarn (approx 3,750 yards per pound). 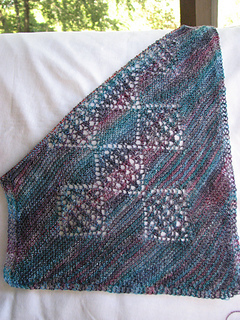 Even if you don’t knit this scarf, the decrease used at each end of each motif deserves attention. Eugen uses a decrease that he found in an old German book… it makes a beautifully centered single eyelet - silken symmetry.